Dr. Tiruvur has Pediatric, Orthodontic and General Dentistry experience. She earned her dental degree from Tufts University, Boston, MA in 1997. Dr. Tiruvur is a highly motivated and passionate dentist. She always looks forward to working with kids. She keeps herself updated in various areas of dentistry. To that extent she participates in study clubs such as TMD Study Club and takes continuing education courses. She also leverages her excellent network of friends in the dental community. Since 1998 she is a member of ADA, CDA and SCCDS. Additionally, she is Invisalign, Implants, Lumineers and Zoom certified. She is focused on Quality of Service with a generous dose of empathy. She loves to meet people and build relationships. Dr. Tiruvur contributes back to the community such as via Give Kids a Smile program sponsored by ADA. Additionally, she is the founding dentist for nonprofit SkoolCare which delivers dental care to underserved children in local schools. She is a Saratoga resident. Her other interests include reading, badminton and biking. At home she spends time with her school going daughter Charu and husband Vijay, a Silicon Valley professional. 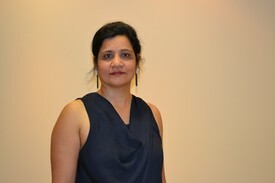 Her older daughter Shefali is pursuing Molecular & Cellular Biology at Johns Hopkins University, Baltimore, MD.